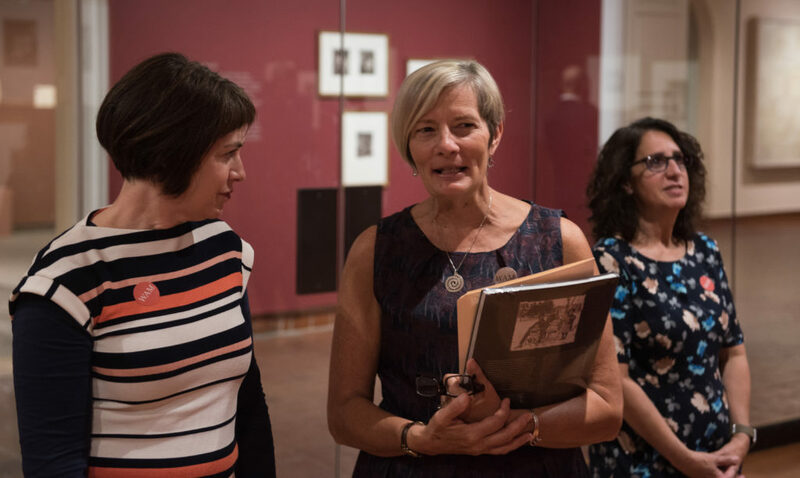 History professors Janette Greenwood, center, and Amy Richter, left, speak at the opening of the “Rediscovering an American Community of Color” exhibition in 2017. The exhibition’s companion catalog was awarded the Historic New England Book Prize. 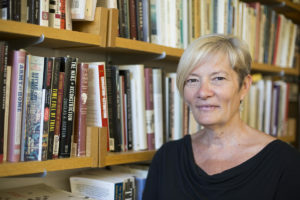 Janette Greenwood, professor of History at Clark University, has been awarded the 24th annual Historic New England Book Prize for “Rediscovering an American Community of Color: The Photographs of William Bullard, 1897-1917,” which she co-authored with Nancy Kathryn Burns, associate curator at the Worcester Art Museum. “Rediscovering an American Community of Color” presents 83 never-before published portraits reproduced from William Bullard’s glass negatives, which depict African-Americans and Native Americans from the ethnically diverse Beaver Brook neighborhood in Worcester. Bullard’s surviving logbook identifies nearly 80 percent of the names and locations of his subjects, which allowed their personal stories — and those of their community — to be told. For nearly four years, Greenwood immersed herself in research focused on the work of Bullard, examining century-old photographs with the help of Clark students. Their research informed the exhibition, “Rediscovering an American Community of Color: The Photographs of William Bullard,” which ran at the museum from October 2017 to February 2018. Ten Clark students researched Bullard’s subjects through “Public History: Race, Photography and Community,” a Problems of Practice history seminar taught last spring by Greenwood and Burns. Historic New England awards its book prize annually to a work that advances the understanding of life in New England from the past to today by examining its architecture, landscape, and material culture. This also includes works in the decorative arts, archaeology, historic preservation, the history of photography, and other related subjects.